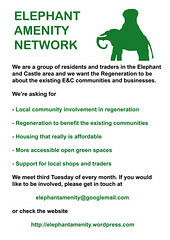 On this page, we are slowly putting up a whole series of documents, papers and relevant historical material to give some sense of the chronology and scale of the by now infamous Elephant & Castle regeneration schemes. Since its inception, the two key targets for the Elephant and Castle Regeneration scheme have been to create thousands of jobs and build 5,000+ new homes. This was to be achieved by demolishing the Heygate Estate and the Elephant and Castle Shopping Centre and replacing them with new retail and housing developments. The first attempt at this – the Southwark Land Regeneration Scheme – failed in 2002. Since then Southwark Council had been awaiting the signature of its development partner, Australian developer Lend Lease, on a masterplan to take the second attempt forward. The deal was finally struck on July 2010. The first document to understand the history of the deal is the 2004 Development Framework: this is the key to the whole regeneration scheme for Elephant and Castle. It is part of Southwark Council’s Unitary Development Plan (The Southwark Plan) and it forms the basis of all developments at the Elephant and Castle. The UDP is to be superseded by the Core Strategy, but Southwark has not produced any other framework document since this one in 2004. Before 2004 the Heygate Estate was occupied by secure tenants, temporary non-secure tenants and leaseholders. With its demolition, the Council was prepared to lose 1212 council homes. The Southwark Land Regeneration Scheme would have re-provided some of the social rented housing on the Heygate footprint, requiring 2 moves, with negotiations about some of the housing being council housing. Non-secure tenants, a relatively small number, would have been rehoused through council stock in the usual way, and leaseholders would have been compensated for the loss of their home by statutory payments. In the Executive Report 18 May 2004, Southwark committed to ‘re-provide a minimum of 1100 affordable rented units’ through the regeneration scheme. This new scheme planned to rehouse secure tenants on 16 ‘early housing sites’, scattered between Bermondsey, Kennington and Blackfriars. These would have been assured tenancies in housing association properties requiring only one move. Tenants could retain secure tenancies only by moving into current council housing stock, while non-secure tenants and leaseholders would be treated as before. Although this second scheme was drafted in 2004, by 2007 no Early Housing site had been built. Nonetheless, on the 19 June 2007 Southwark adopted the Heygate Action Plan, which allowed the estate to be decanted. According to this plan all residents were to be removed from the estate by September 2009. Secure tenants were to be given the right to move a second time, into the ‘early housing sites’ once built. All others, including leaseholders who could not afford to buy again, would remain permanently in current stock. Heygate tenants have had to rehouse themselves by bidding for available properties through Homesearch magazine. If they did not find somewhere within a given period then direct offers were made. Eviction proceedings begun on the estate, notices of possession and to quit were issued, preparatory to court action were tenants to refuse the offers. More on the myths of the Heygate here. Here is a schematic representation (September 2008) of the “regeneration” area. B Strata Tower (Developers: Brookfield Europe) Completed May 2010. C O-Central – Crampton Street (Developer: Oakmayne Properties) Completed July 2007. D South Central East – Steedman Street (Developer: Oakmayne Properties) Completed Feb 2006.
next to St Mary’s Churchyard (Developer: First Base) Completion expected early 2011. H Vantage – Metro Central Heights (Developer: St George) Completion 2008. By 2009, however, only 6 of the 16 ‘early housing’ sites had received planning permission. In 2009 Southwark had a 15,500 strong housing waiting list (see Southwark Housing Strategy report). In previous reports, the vast majority of these (over 90% according to Southwark’s Housing Need Survey 2003, 70% the 2006 update) could only afford social rented housing, and there are reasons to believe that the situation has got worse. Although the deal has now been signed, the fate of the Shopping Center remains uncertain, as Land Lease and Southwark Council have so far failed to reach an agreement with current owner St. Modwen. Does Southwark need more student housing? Here are two documents that relate to this debate. The first is the Council’s own document from July 2010, prepared for them by BNP Paribas Real Estate that tries to answer this question. The second is the appeal decision made by an officer of the Government’s Planning Inspectorate concerning the site of 120-138 Walworth Rd, the old Shell garage on the south side. Goldcrest wanted to build 232 units of student accomodation but the Council refused permisson. The Planning Inspectorate has now allowed Goldcrest to build. Seemingly throwaway, these references to infamous sink estates and crime reinforce the Councils and developers regeneration agenda and erase the real history and desires of local people. None of these articles ever mentions the dis-investment from the Council that accounted for a lot of the bad conditions in the infrastructure of The Heygate. Such a dis-investment over time was always useful for the Council in giving local tenants very little real choice about regeneration possibilities. These kind of newspaper articles always seem to suggest that the 70’s architecture itself creates poverty and deprivation but they never say that the inequality and suffering comes from the society with live in and not as a result of large public housing, regardless of the building poor design. ‘Harry Brown was shot on the Heygate estate in Elephant and Castle, south London, not far from where Caine grew up…A few months before the film came out, in the summer of last year, a real-life gang – led by Callum Hall and Deniz Ozdil – was terrorising the nearby Aylesbury estate’. ‘Heygate was only built in 1968-69 and quickly became a sort of human dustbin. It exemplified the notion that if you give people sties to live in, they will live like pigs’. ‘The Heygate Estate, which housed 700 people in what looks like a medieval blockhouse, and the Aylesbury Estate, with its 2,700 homes stretching south for more than a mile parallel to the Walworth Road, became sink estates plagued by crime, drugs and prostitution’. ‘…dilapidated and crime-ridden Heygate Estate’. ‘…that vision has largely ended in crime and deprivation, as the fate of the Heygate estate shows’.